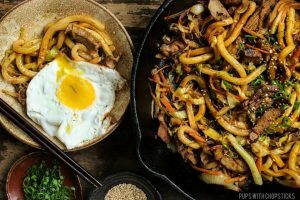 A yaki udon recipe with thick & chewy udon noodles that absorbs all the flavours of the lightly sweetened maple curry & provides a satisfying chewiness! Great use of leftover meats or go meatless! Noodles are one of my ultimate favourite foods. There’s always something so comforting and satisfying about eating them so it’s no surprise when I have to make it at least once a week. 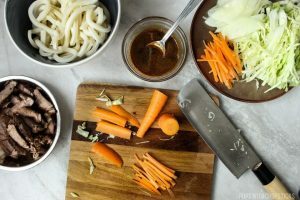 I find myself making udon noodles more frequently than any other noodles because they are easy and quick to make and it’s a great way to clean out my fridge of old produce or leftover meats. Normally, I would go the simple route and make the traditional yaki udon with soy sauce but today I had a random craving for curried Singapore rice noodles so I just transferred that craving to my udon noodles. Most ingredients in this recipe should be available at your local grocery store. 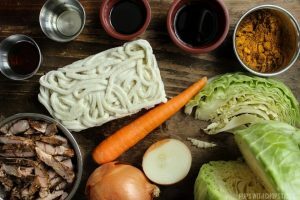 Mirin and frozen sanuki udon noodles might be a bit trickier to find, but should be available at an Asian grocery store. There are a few types of udon noodles in the market – frozen, vacuum packed and dried. I highly recommend using the frozen ones since they have a chewier texture and generally taste better. 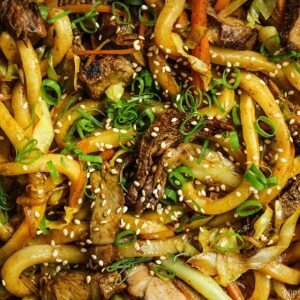 I like to use leftover meats whenever I make a stir fried udon but this can also be completely meatless as well. Sometimes I’ll even throw in some deep fried tofu balls if I need a protein kick if I’m not using meat. The vegetables are also very interchangeable in this recipe. You can use almost anything out there as long as it’s not watery (like tomatoes). 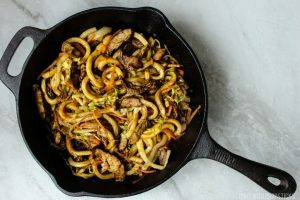 I used cabbage because it’s easy to brown up when sliced thinly and it gives this dish a nutty flavour. 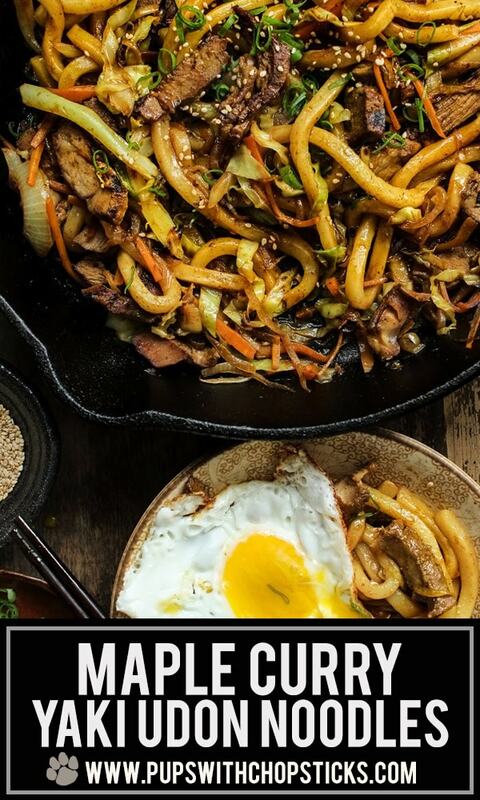 The dark soy is used to give the noodles a bit of colour so if you don’t have this you can omit it. Whenever I cook, I always prefer to use maple or honey to sweeten my dishes – mostly because they are already in liquid form and very easy to incorporate into the dishes. I find when I use sugar, I need to take the extra steps to melt the sugars else I’ll get granules of it in the food. This recipe is a simple one and can be whipped up quickly. Chop up your vegetables and leftover meats and side aside. The thinner you slice them the quicker they will cook. Combine the maple, curry powder, both soys, and the mirin together in a small bowl and set aside. In a frying pan, set the heat to medium heat and add a bit of oil to it. Wait for it to get hot, watch for the oil to shimmer. Note: Don’t like curry? Omit it! 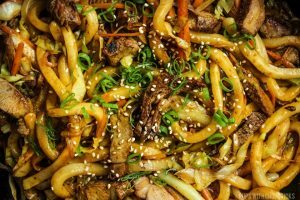 🙂 Then you’ll have the traditional stir fried yaki udon recipe! Whenever I have a sauce noodle or rice dish, I love adding a fried egg on top. This is completely optional but a great way enjoy it as well. 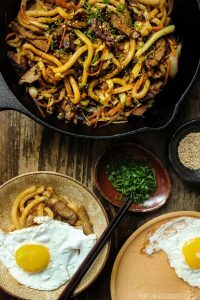 A yaki udon recipe with thick & chewy udon noodles that absorbs all the flavours of the lightly sweetened maple curry & provides a satisfying chewiness! The curry powder I use for this recipe is Madras curry powder which is very similar to regular curry powder but it’s spicier. This recipe can be made with regular curry powder as well. For the best udon noodle texture (chewy with a bit of springiness), buy the frozen udon noodle that comes in blocks in the freezer section. Don’t like curry? Omit it! 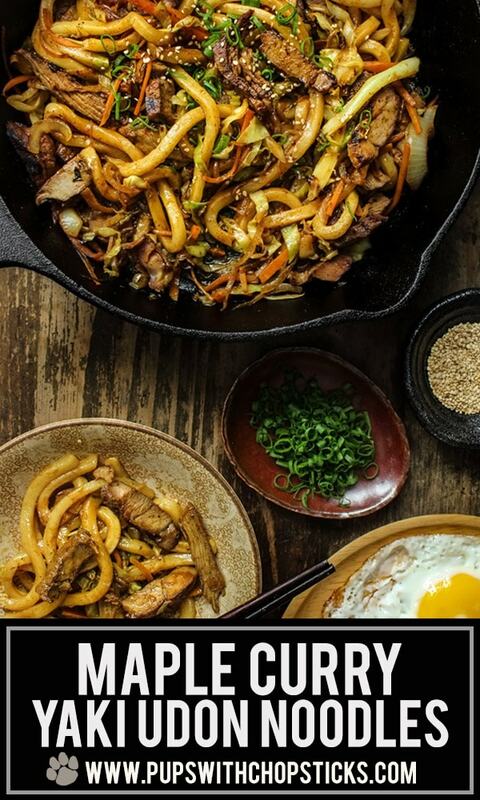 🙂 Then you’ll have the traditional stir-fried yaki udon recipe! Is the curry powder you use same as Indian curry powder? If not where can I find the Japanese version. 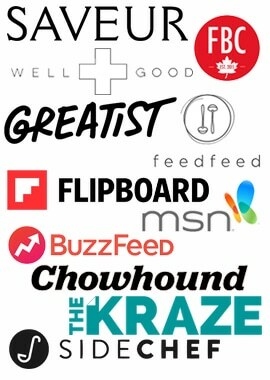 Is there a particular brand you recommend? I have also used regular curry powder from my local grocery store too, which I find in the Indian foods section and those also worked too! The main difference is that it’s less spicy. I have learned about yum-yum sauce however did not know exactly what it had been. This somewhat resembles the sauce that they function within Spicy Susan beef, storing it this particular. Gotta watch make this! maple curry?! girl, your brain sounds like a fabulous place to live. also, udon everyday please. Are you sure about that? I’m pretty sure it’s a little bit wonky with a side of crazy in there haha and Yes! Udon everyday please! I can’t get enough noodles in my life. This sauce sounds so flavorful and delicious! And those noodles!! Can’t wait to try! Hey! 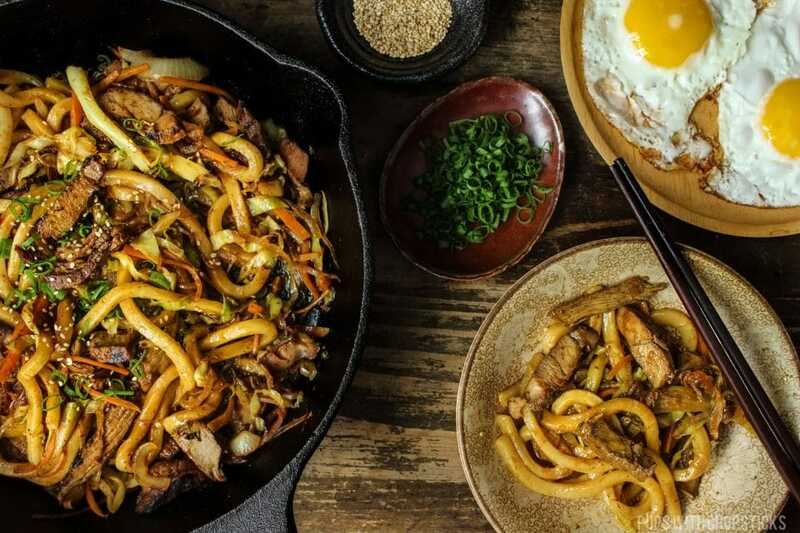 A quicker way to make this Maple Curry Yaki Udon for lunch or dinner. Kids love this because of a different flavour of taste. Thank you. We’re lucky to have a couple of really good Asian grocery stores nearby, so I’m thinking I’d be able to find everything for this! It looks delicious! You can totally make this a meatless dish too, I like to add the pre-packaged fried tofu balls and mushrooms. Love the name of this dish! It sounds delicious! It sounds truly delicious! I love noodles yet I’ve never prepared them at home 🙁 Time to change it, I think. 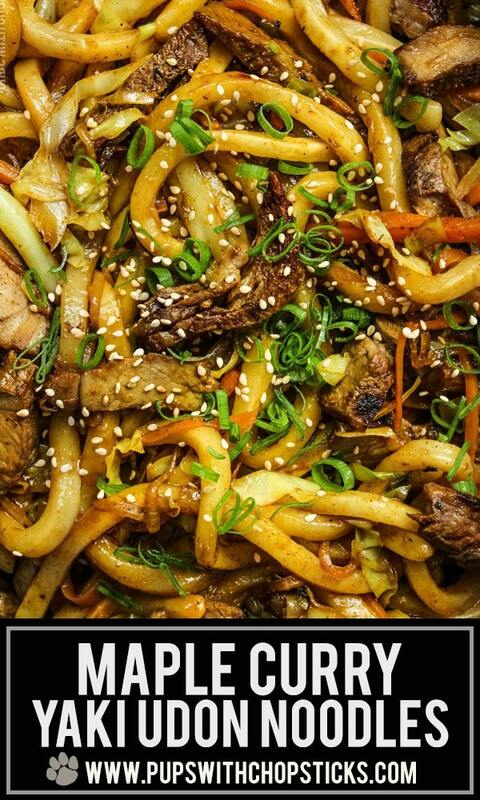 Maple curry yaki noodles packed with flavours, looks tempting!